Phrixus was the son of King Athamas of Boeotia, born to his first wife, Nephele, a cloud nymph. Nephele was probably an Oceanid nymph, rather than the cloud nymph crafted by Zeus to confound Ixion. Phrixus would have a sister, Helle, born to Athamas and Nephele. Athamas and Nephele would separate though, for Athamas now desired a mortal princess, Ino, daughter of Cadmus, and so Phrixus and Helle had a new stepmother. As was the way with so many stories over the millennia, Ino turned out to be a wicked stepmother, for Ino had an intense hatred of her stepchildren, Phrixus especially. Ino had born to Athamas two sons, Learchus and Melicertes, and now sought to cement their positions as heirs to the Boeotian kingdom. Ino plotted, and created an imaginary drought in Boeotia, and then had Athamas’ own heralds bring back false news from the Oracle of Delphi, proclaiming that the drought and famine could only be lifted if Athamas sacrificed Phrixus. Athamas was forced by his own subjects to listen to the message, and a sacrificial alter was constructed. Nephele though, had not abandoned her children, despite separating from her husband, and the cloud nymph intervened to rescue Phrixus, and Helle. 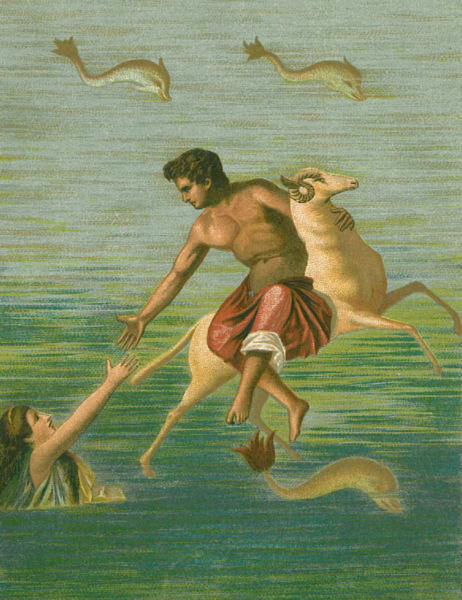 The Golden Ram, child of Poseidon, was dispatched to Boeotia to rescue the children of Athamas and Helle. The Golden Ram was a magical beast, with the ability to talk, as well as the capacity to fly. Landing in Boeotia, the Golden Ram had Phrixus and Helle climb upon its back, and then taking to the air again, the Golden Ram headed towards Colchis. The plan was to put as much distance between Phrixus and Helle, and Ino, as possible, and Colchis was at the end of the known world. The flight was long though, and whilst Phrixus managed to hang on to the fleece of the Golden Ram, the younger Helle found herself losing grip. Finally, the hold of Helle failed, and the sister of Phrixus plunged to her death at the point that would thereafter be known as the Hellespont. Phrixus could do nothing to save his sister, and so astride the Golden Ram, the son of Athamas flew on to Colchis. Upon landing in Colchis, the Golden Ram itself then informed Phrixus that he must sacrifice his rescuer to Zeus, and then take the Golden Fleece to King Aeetes, the ruler of Colchis. Phrixus did as the Goldren Ram said, and into the royal court of Aeetes, walked the son of Athamas. At the time, Aeetes was a hospitable king, and the king willingly accepted the magnificent gift offered by the newcomer to his land. The Golden Fleece would then be placed into the Grove of Ares. Aeetes was so enamoured with Phrixus, that the King of Colchis presented Phrixus with a new wife, in the form of Aeetes’ own daughter Chalciope. It was commonly said that Phrixus became father to four sons by Chalciope, Argus, Cytisorus, Melas and Phrontis. These four sons of Phrixus would appear in the tale of Jason and the Argonauts, when the Argo rescued the brothers as their ship floundered as they sought to sail to the land of their father. It was said by some that Cytisorus did get back to Boeotia at some point, for he would prevent Athamas, Phrixus’ father from being sacrificed there. The probability was that Phrixus lived out his life, to an old age, in Colchis with Chalciope. Bringing the Golden Fleece to Aeetes benefited Phrixus greatly, but ultimately proved the downfall of Aeetes, for it brought a change over the king of Colchis. For Aeetes changed from being a hospitable host, to one who put all strangers to death, for it was retold that he would lose his kingdom if the Golden Fleece ever left his kingdom; and of course, years later this is what occurred with the arrival of Jason and the Argonauts in Colchis.